Every so often an album comes along which does more than entertain, it taps into the pulse of the land. It reaches a level of poetic that doesn’t just sing, it stands as a testament to a condition. Setting out to embody the romance and vastness that is the American West, singer/songwriter Marc Berger did the seemingly impossible. He has captured the massive essence of the mountains and desert that were settled through blood and sweat of generations before us and molded it into ten songs. Like standing in the middle of a road that disappears east into a distant dot and west into uncertainty with nothing but saguaro dancing and a warm breeze, Ride isolates you and paints a stunning picture of what was, is and what will continue to be. As the ten track album rolls in on the skidding snare, “Nobody Gonna Ride on the Railroad” opens the book that is so vividly drawn throughout. A sentimental proclamation to a dying journey, Berger masterfully pays tribute to a huge part of what made the West great. His ability to harness the style and craft, mirroring the talents of Dylan and Cash, transcends modern acoustic folk. Tracks like “Time Waits For No Man” and “Twister” dissolve into a painting of songwriting and acoustic guitar which bleeds with genuine passion for the art of storytelling. With his low, slightly raspy vocals and incorporation of harmonica and guitar, Berger creates a new classic. 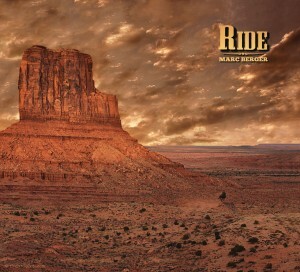 Ride is a hypnotic, longing stare out a window looking over a vast land that is too often ignored. The album delivers on authentic and should be held in regard with the writing of Harvest Moon and sound of the best acoustic folk you can find. If you have ever stood on the edge of The Grand Canyon, stared into the beauty of The Painted Desert or stood in awe of the Rocky Mountains, then this album is for you. As it speaks to the treacherous landscape it leaves you in a warm comfort. Ride is inspiring. An album like this is rare, it makes the writers want to write and singers sing. It should come as no surprise that this is easily one of the best albums I’ve heard in 2012. In all of its modest being it looks to give nothing more back than a thank you to the land. For that, Thank you Marc Berger for letting us Ride. This entry was posted in Reviews and tagged acoustic, Folk, Marc Berger, music, nanobot, Nobody Gonna Ride on the Railroad, review, Ride, Time Waits For No Man by Greg. Bookmark the permalink.